Dental implants are today’s preferred choice for replacing missing teeth. They’re the closest restoration to natural teeth—but at a price, especially for multiple teeth. If implants are beyond your current financial ability, there’s an older, more affordable option: a removable partial denture (RPD). 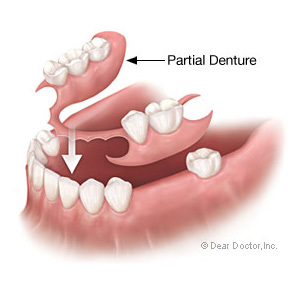 Similar in concept to a full denture, a RPD replaces one or more missing teeth on a jaw. It usually consists of a lightweight but sturdy metal frame supporting a resin or plastic base (colored pink to mimic gum tissue). Prosthetic (false) teeth are attached to the base at the locations of the missing teeth. Unlike transitional dentures, RPDs are designed to last for many years. Although simple in concept, RPDs certainly aren’t a “one-size-fits-all” option. To achieve long-term success with an RPD we must first consider the number of missing teeth and where they’re located in the jaw. This will dictate the type of layout and construction needed to create a custom RPD. In addition, we’ll need to consider the health and condition of your remaining teeth. This can be important to an RPD’s design, especially if we intend to use them to support the RPD during wear. Support is a fundamental concern because we want to prevent the RPD from excessively moving in place. Besides dental support we’ll also need to take into account how the jaws function when they bite. The RPD’s design should evenly distribute the forces generated when you eat and chew so as not to create undue pressure on the bony ridges of the jaw upon which the RPD rests. Too much pressure could accelerate bone loss in the jaw, a common issue with dentures. It takes a lot of planning to create a comfortably-fitting RPD with minimal impact on your dental health. But you’ll also have to maintain it to ensure lasting durability. You should clean your RPD daily, as well as brush and floss the rest of your teeth to minimize the chances of developing tooth decay or periodontal (gum) disease. You can further discourage disease-causing bacterial growth by removing them at night while you sleep. A RPD can be a viable alternative to more expensive restorations. And with the right design and proper care it could serve you and your smile for a long time to come.